As the days tick by and the weeks diminish towards the date of publication, REMOVED slowly makes its way into the public eye. Just this week I sent off the paperback version to Createspace! The book is 365 pages long (funny that if you read a page a day you could finish it in a year!) and it was all designed by me including the cover. I learned a lot during this process! 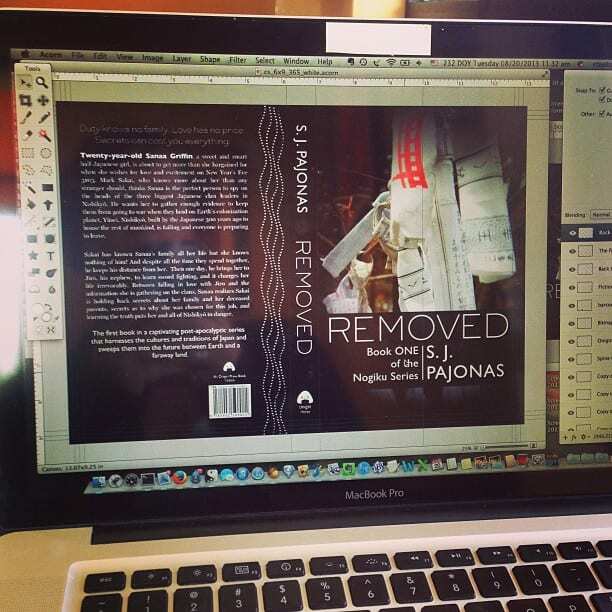 Recto and verso paging, margins, and how to set up a paperback to compile from Scrivener. I hope to get a tutorial up on the blog soon about that. I’m sure you Scrivener folks will love it. Once I point out the margin pitfalls, you’ll see it’s really easy to compile straight from Scrivener to a print-version PDF. That software is truly amazing. I woke up this morning to an email from Createspace saying my proof is ready to go! I ordered it and should get it next week. I can’t wait to hold it in my hands! Wow. Holding my actual book in my hands two and a half years after sitting down to write the first draft. My mind is blown. The final price point for the book should be $13-$14. This is for the paperback version — the eBook version will be much lower — but even at the higher price, I know how important it is to some people (including me) that the option of a physical book be available. I’m glad I took the time to get it ready for launch day. To make my day even brighter (though it’s been raining cats and dogs all morning), I asked the Goodreads librarians to add REMOVED to Goodreads and they did! I’m also a Goodreads author now too. Another wow! I can’t believe it! It’s almost official. Last step now is to finalize and publish. Only a few more weeks! Still have some hurdles to overcome, more teaser images to post, and more ARCs to send out to friends and book bloggers. But I’m in the home stretch now!